The lovely old church dedicated to St Mary and to St Blaise dates from the early twelfth century. From an entry in the Domesday Book we know that Boxgrove had the status of a parish and that a church existed here before the Norman Conquest. All traces of this have been obliterated by the Priory, which is the daughter house of the Abbey of Lessay in Normandy and the "grand-daughter" of the great Benedictine Abbey of Bec Helouin. A more detailed history is available elsewhere on this site. "It is a magical church full of echoes of French influence along the Sussex coast. Its crossing is a mystery of light and dark and the great chancel is alive with Tudor roses and heraldry. The De La Warr chantry contains beautiful early French motifs from a Book of Hours. These must be some of the best renaissance carvings in any English church. They make Boxgrove very special." 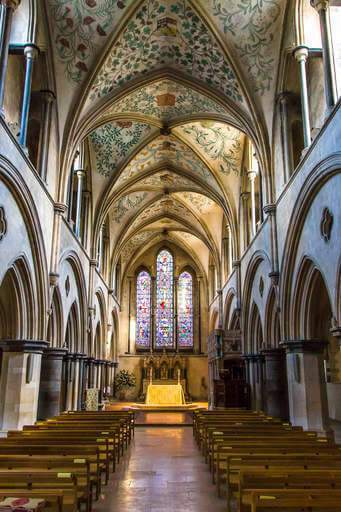 The Priory Church sits in a delightful village in West Sussex, some 3 miles from the Cathedral City of Chichester and for over 900 years the villagers of Boxgrove have worshipped in this magnificent building. Its glory is still much in evidence in spite of losing the west end of the Priory during the Dissolution of the Monasteries in the reign of King Henry VIII. We hope that you not only enjoy this site but find the opportunity to visit us in person. If you wish to arrange a wedding or a baptism in the Priory, please contact Fr Ian in person after the 11:15 Mass on Sunday.